One of my favorite things about both the 2015 and 2016 Rubber Tramp Rendezvous (RTR) gatherings were the free piles. Both years, organizers set up an area where people cold leave things they didn’t want and other folks could pick up anything they did want, all with no monetary exchange or bartering. I love gift economy! I don’t remember everything I gave away the first year, but I know I added to the pile. Likewise, I don’t remember everything I took from the free pile either, but I know I got one of the items I use most in van life from there: my pee bucket. It’s plastic, with a cover that latches on tightly. The lid has a handle too, which makes carrying the bucket over to a bush or a pit toilet very convenient. To make the fact that I’m transporting urine in it less obvious, I wrapped it in pink duct tape. Thanks free pile! This year I added two books, a pair of worn-only-once black leggings, a small plate, multiple glue sticks, and other odds and ends I can’t remember to the free pile. (I should have written an inventory of what I contributed.) In return, I got so many good things, even though I was being really picky about what I took back to the van, since I’m trying to live with less, not collect more stuff I don’t really need. I picked up quite a bit of food from the free pile this year. Early on, I got two cans of vegetarian refried beans and two large cans of tuna. Later I picked up a sealed box of whole grain spaghetti. After the soup dinner, the head cook contributed to the free pile all the cans of food not used for the soup or chili dinners. I picked up a small box of vegan, organic black bean soup; a jar of organic spaghetti sauce; another can of vegetarian refried beans; a can of black beans; two cans of garbanzo beans; a can of sliced carrots; five cans of diced tomatoes; and three cans of chili beans. One day I dug through the piles of clothing and found a brightly colored fleecy Cuddl Duds brand shirt. It was only a large, and I usually wear XXL shirts, but it looked rather big, so I took it to my van home anyway. Because the fabric was stretchy, it fit me, albeit snugly. It was very warm and comfy, and I wore it on two of the coldest nights at the RTR. Although lots of books were dropped off at the free pile, I already had lots of books in the van, so I was very particular about what I took. I did pick up one hardback book that looked entertaining. It’s called Cinnamon and Gunpowder, and it was written by Eli Brown. It’s a novel about a fancy chef who’s kidnapped by a female pirate, and it turned out to be a great read. At the end of the gathering, I couldn’t resist picking up Almost French, a memoir by Sarah Turnbull about being an Aussie in Paris in the mid 90s. This is the chair I scored from the RTR free pile. 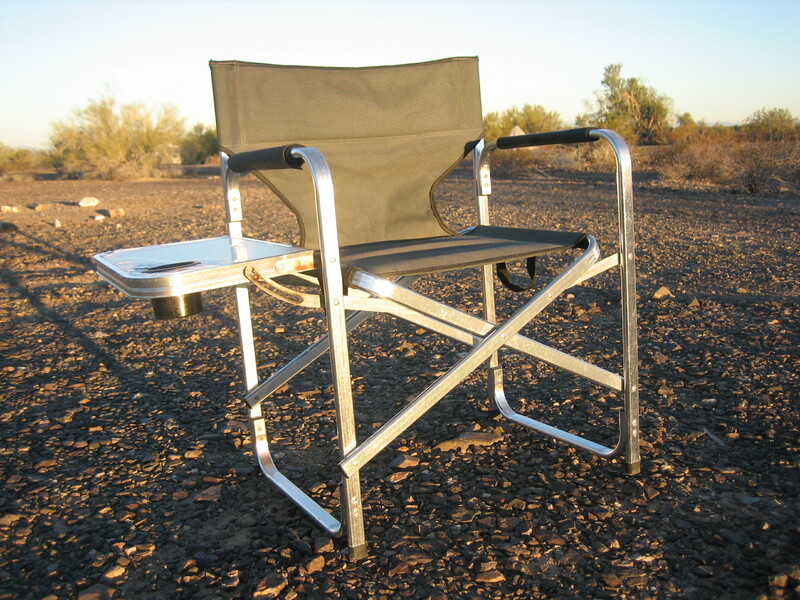 Possibly the best item I got from the free pile (it’s a tossup between this and the furry purple sweater), is a very sturdy folding camp chair complete with a folding tray on the side. When I first tried to lift the tray, it was difficult to move, due to some rust. Thanks to a squirt of WD40 (Thanks, Miz Sassy! ), I got the tray sliding easily. The top surface of the tray had some (water?) damage, so I decided to collage and decoupage. This is how the tray looked when I got the chair from the free pile. 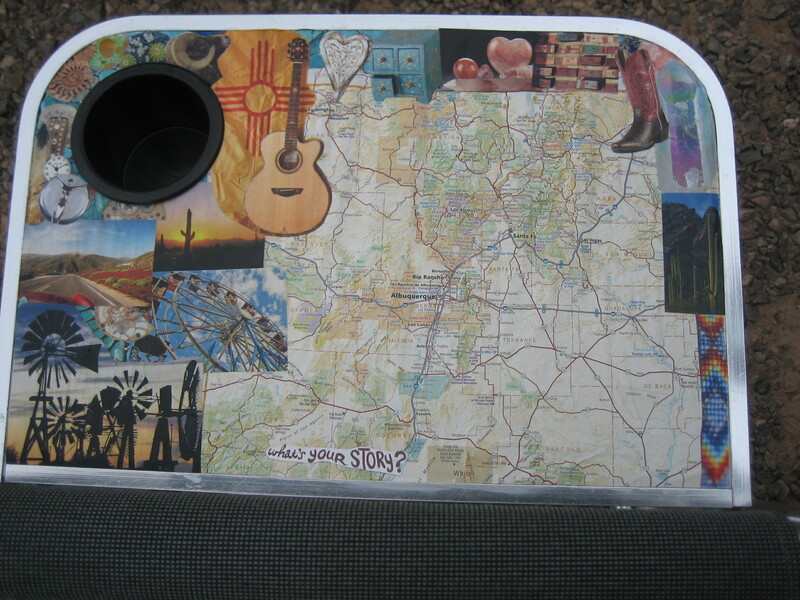 This is how the tray looks after my collage and decoupage action. The map is of New Mexico. (It only shows Taos to Socorro.) Many of the other images are of or remind me of the Southwest. Organizer pockets originally on my from-the-free-pile folding chair, now on my passenger seat. I can easily grab my water bottle while I’m driving because it’s not rolling around on the floor. My phone goes in one of the top pockets. 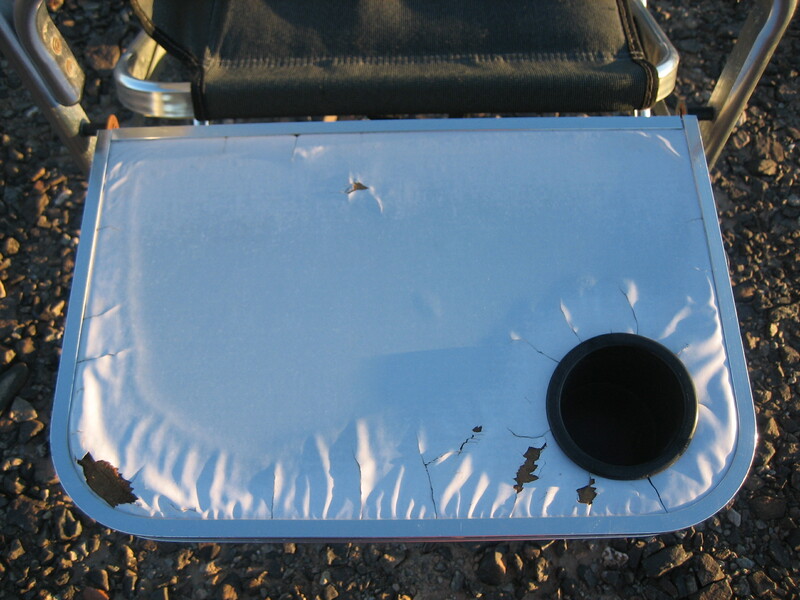 The side of the chair without the tray sported a really nice set of pockets. 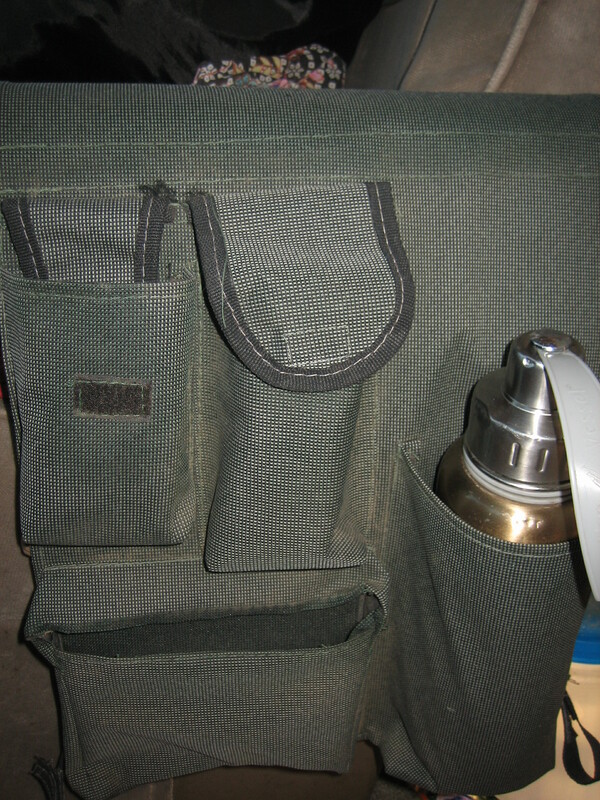 The pocket bag was attached to the chair with hook and loop fasteners, so it was really easy to remove. I attached the pocket bag to the arm of my passenger seat with large safety pins, so now i have a handy place to keep my water bottle, phone, insurance papers, and van registration while I’m driving. I always have a great time looking through free piles, and I particularly enjoy finding a few great pieces that make my life a little more comfortable. The RTR free pile hasn’t let me down. Thanks Brent! Glad the photo did what my talking couldn’t. Cheers! You know I loved this post….did or will the tray/metal hold up? You might want to be figuring….or what about a TV tray…..might not be sturdy enough…..could be supported by side of van…. wondering what you use for a table…..that’s a start….but an eating and a work space would be nice….I’m thinking you don’t always have a nice sturdy park picnic table. The tray is holding up. It is not really a work surface (because it’s on the side of the chair) and I don’t think it was ever super sturdy. I think it’s really just a place to put one’s beverage and maybe one’s plate if one must leave the chair in the middle of the meal. I plan to shellac (or something) the collage when I get to a place where I can borrow a little of the supplies someone already has. When I need a real table, I have two big ones I used for vending. I usually set those up if I am going to be somewhere for a few days. I often just set my stove on the floor of my van to cook, and I usually sit on the floor of the van when I’m eating or to do craft projects.